It had been a big news that Julien Royer, the ex-excutive chef of JAAN, left and opened his own joint venture 'Odette' with The Lo and Behold Group in 2015. The restaurant is named after Royer's grandma - Odette, who influenced Royer a lot no matter in life or in the kitchen. 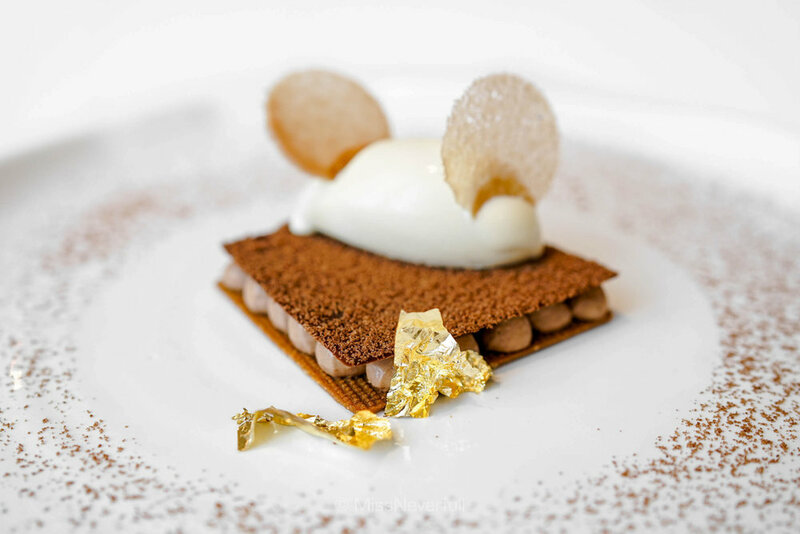 Odette serves exquisite Modern French cuisine at the heritage National Gallery Singapore. To be honest, I never expected a 3-week wait to get a reservation at any restaurant in Singapore, thus my expectation was quite high, and the outcome really surprised me, a lot. 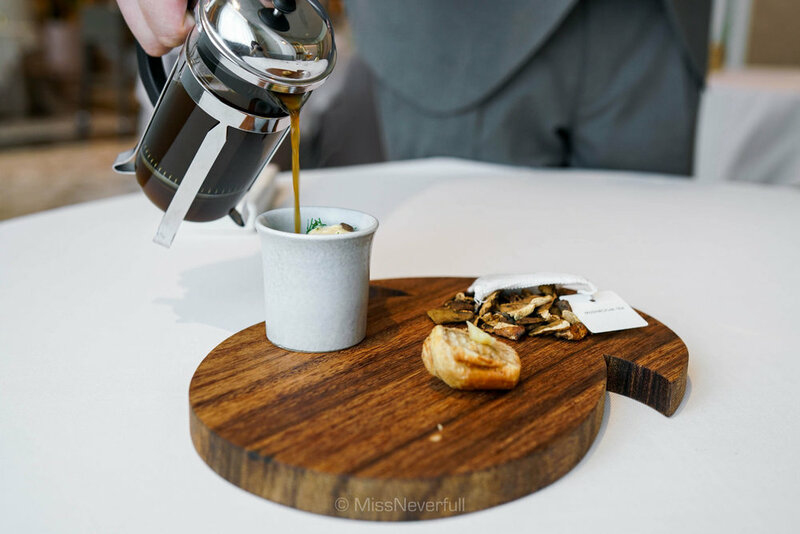 Odette serves only chef's menu that varies daily. Lunch is priced at $88, $128 and $188(++) for 4,6, and 8 dishes respectively, dinner is priced at $208 and $268 (++) for 6 and 8 courses. 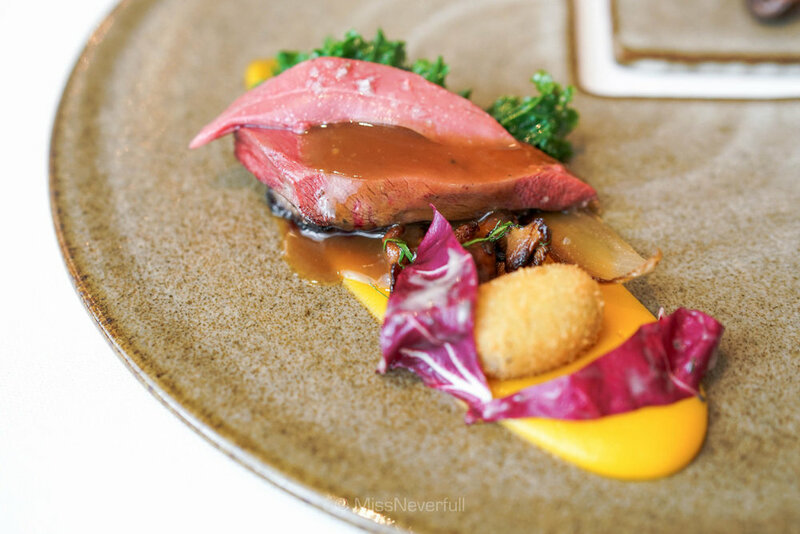 For foodies who has limited budget and wish to try their more-afforable lunch menu, try their Saturday lunch at $148 for 6 courses or $208 for a complete 8-course discovery. The meal kicked off with four finger snacks (complimentary): polenta crisp with confit tomato, charcoal crispy pita with hummus, 'cheese cake' with candied walnut, cumin tart with oat and lentils. All quite unique and beautifully done. 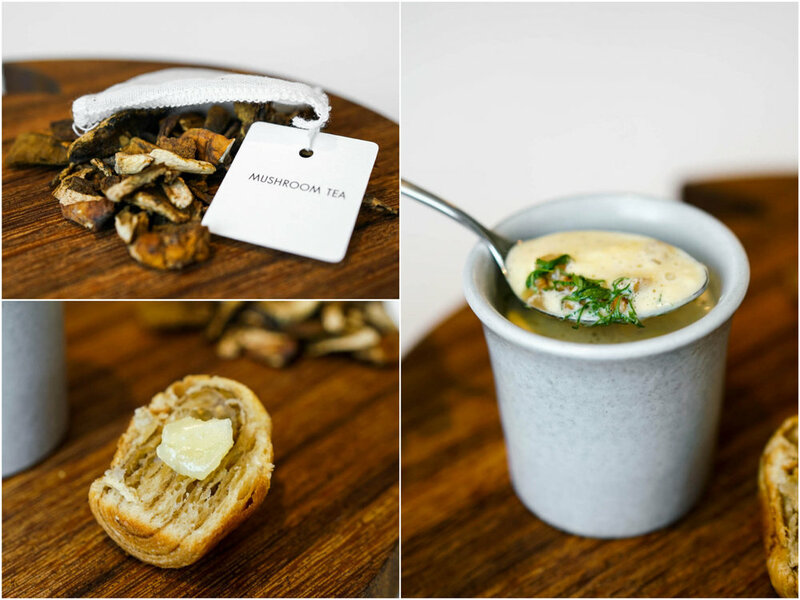 Followed by Royer's signature mushroom tea, which impressed a lot me everytime i visited JAAN. 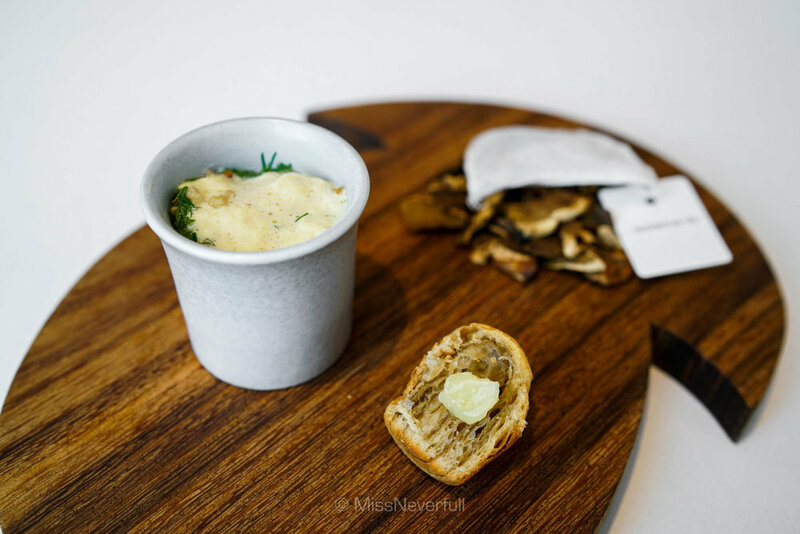 It is such a heart-warming soup with a very deep mushroom tastes, the clear soup on the bottom balanced-well with the airy foam on the top. With toasted buckwheat to give a crispy texture, entire combination is really textural and flavorful. 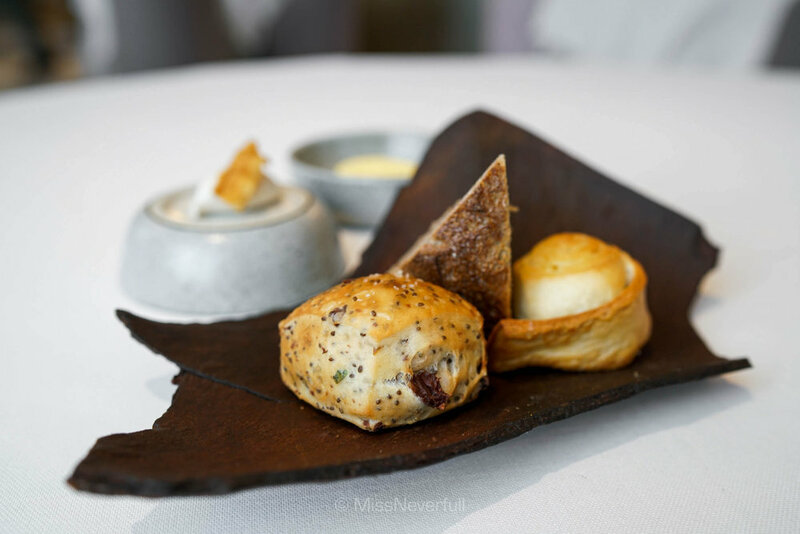 The mushroom brioche on the side again enhances the depth of the dish, loved its flaky skin with a soft and airy center. A good restaurant would never miss any chances to impress the guests, and quality breads always plays part of it. The bread basket includes a hearty savory chia seeds bread with a savory hint of olives, sourdough with a crunchy crust and soft center, and a flaky & buttery homemade brioche. Served with French butter and homemade lard butter on the side. A beautiful dish of Hokkaido sea urchin came to the table first, it looks so delicate that i coudn't find my heart to destory it. On the bottom you can find dine-chopped fresh langoustine and Hokkaido uni, top with airy mussel 'cloud' with Oscietra caviar and gold foil, the cutest part is no doubt the chives 'spine' used to pretend a real sea urhcin shell. It taste exactly as good as it looks - fresh oceanic flavors with creamy and airy textures, luxerious umami flavors of caviar again lifted the flavor to another level. The followed hand-dived Scottish scallop brought a refreshing breeze that brings me back to the shore. I really loved the spicy Jalapeno sorbet which was actually quite clean, and matches well with the flavor of sudashi (Japanese lime). The scallop was very tender and juicy. Such a dish of harmony flavors. Royer's most famous 55' rosemary smoked organic egg brings me back to the land. 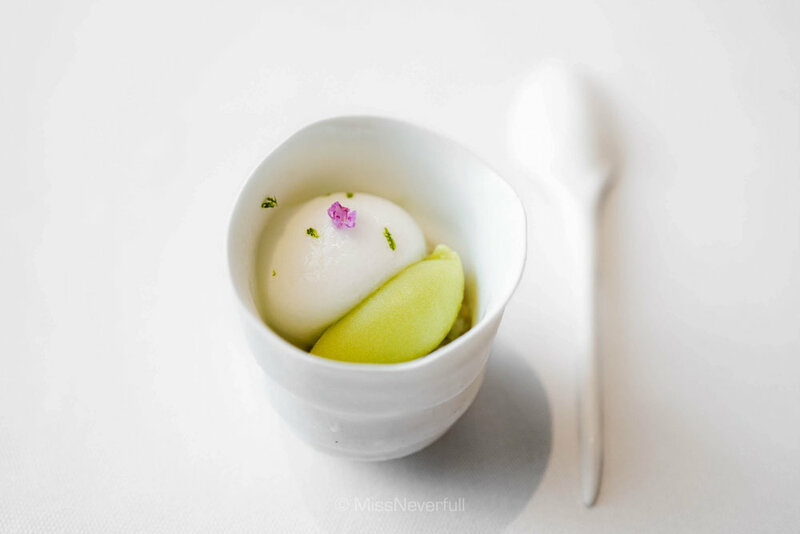 The organic egg has been cooked sous vide at 65.3 degree precisely for 55 minutes, and comes in an egg carton with dry ice flowing underneath, the rest part of the dish is served in a doublE-walled flass on the side, with rosemary smoking on the bottom. 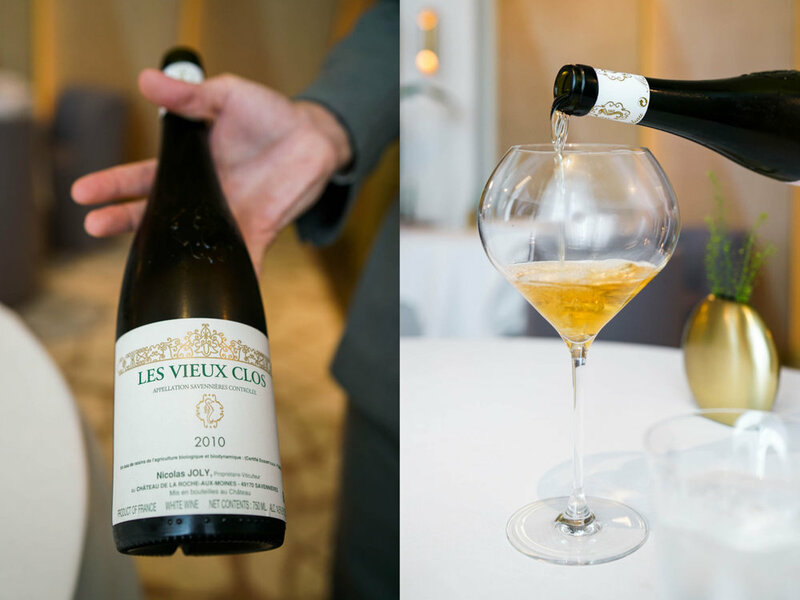 Then the server gently pours the soft egg into the glass... It is hard not to remember the presenting of this dish, but the taste is also memorable too. As a speacial request, chef Royer replaced the chorizo with cep mushroom for me. 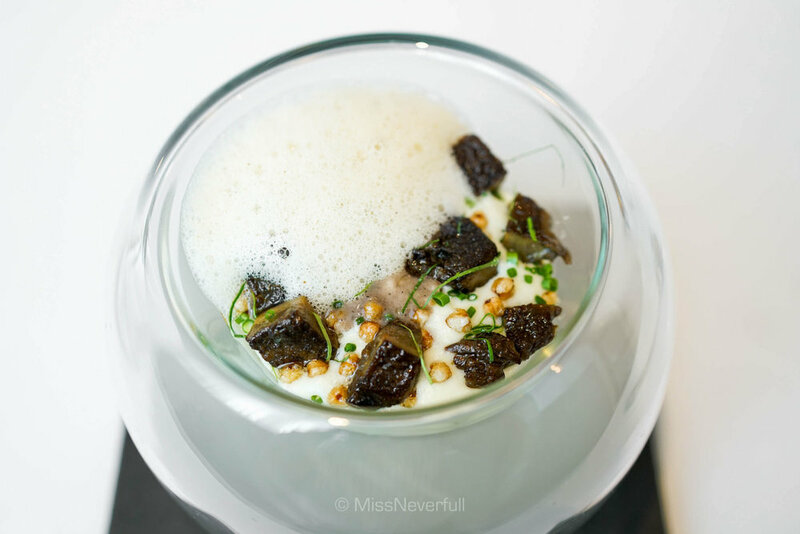 The cep mushrrom was seared and presernted on a bed of smoked potato potage with a twsit of cep mushroom, topped with airy foam and toasted buckwheat. The egg was perfectly cooked, it is incredibly soft and creamy. After mixing up all the ingredients, the outcome was nothing but amazing. It seems a bit heavy to have seared foie gras after the last creamy dish, but you don't need to have such worries at Royer's place. Soured from Maison Mitteault, the foie gras was wonderfully-seared. 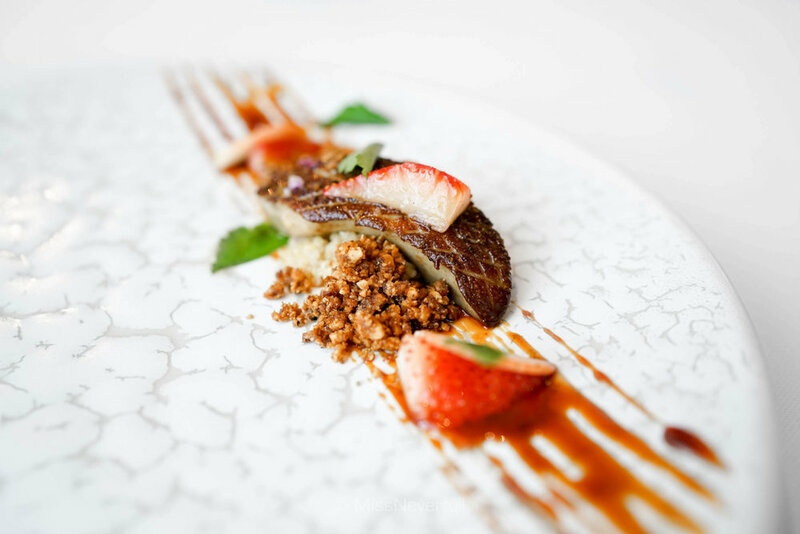 The the sweetness of the Japanese strawberries as well as the sourness of the lemon quinoa balanced the high oil contents of foie gras, and and toasted hazelnuts added a crunchy texture. The Asian-twiested Miso caramel is quite special and works well with the dish. Next comes another beautiful dish, a new creation that chef Royer quite proud of. 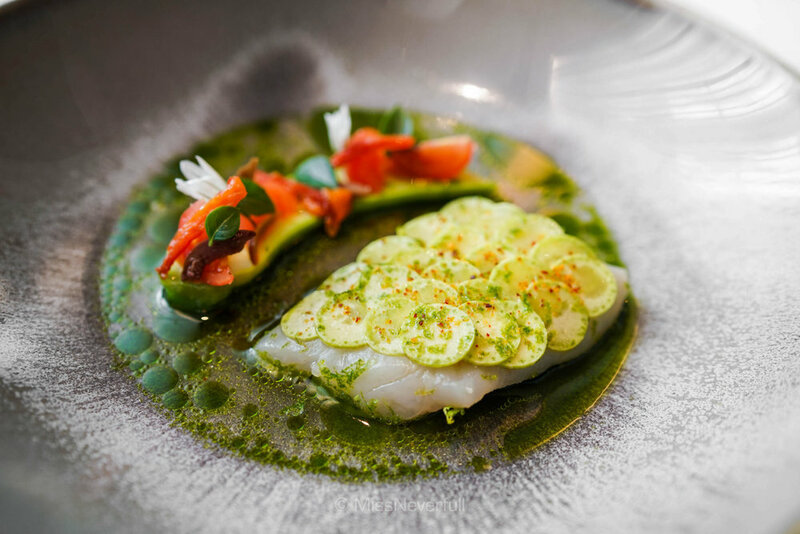 Featuring a fillet of steamed whiting from la Continiere with a Trumbetta zucchini scale, zucchini with confit tomatoes on the side, and a clear broth made of tomato and basil infused by Nicoise olive. The texture of the whiting was similar to rarely touched, very juicy and clean that matches well with the crunchy zucchini scales. This dish was overall quite clean and the spices gives a little surprises to my taste buds. Absolutely loved it. Another highlight of the meal was the hay-roasted pigeon served in two ways. 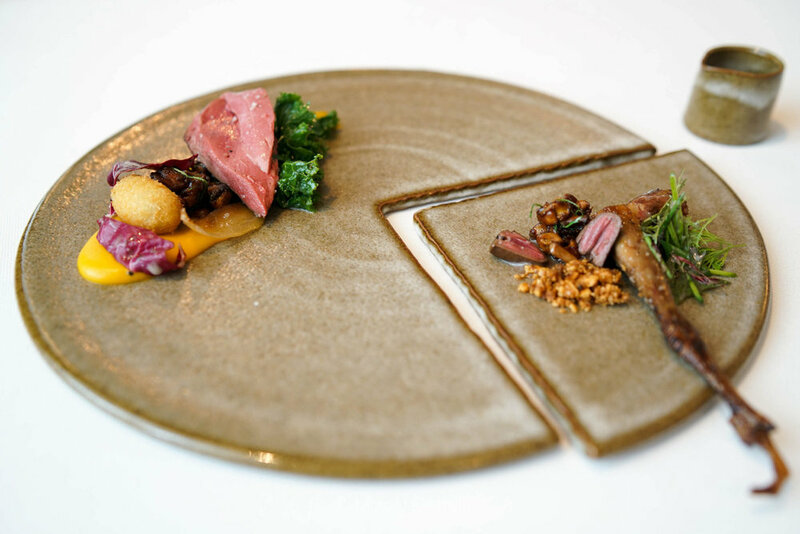 The pigeon was nicely plated on a puzzled-plate, on this side was barbecued pigeon breast on a bed of Kabocha puree, and a confit pigeon leg and seared heart on another side of the plate. Seriously, i haven't had such delicious pigeon dish in a long while. The pigeon breast itself was so succulent and flavorful, served with only with a pinch of rock salt and its broth to enhance the flavor, it was as good as it looks, or even better. The sweetness of Kabocha (Japanese pumpkin) puree too works well with the meat. Of course the pigeon leg was also enjoyable, inside its thin crispy skin was very tender and delicious meat. The heart was chewy and delciious too. The pre-dessert was a lemon verbena consists of flavors of mint, bay leaf and cucumber. It was such a clean and refreshing dish to cleanse my palates. And a very satisfying sweet ending - 66% Mexican chocolate chip and mousse on a chocolate cookie base, with tonka bean ice ream and menut & almond praline on the top. It was a mouthful of cripsy and smooth textures with deep chocolate flavors, the sweetness was right to point. 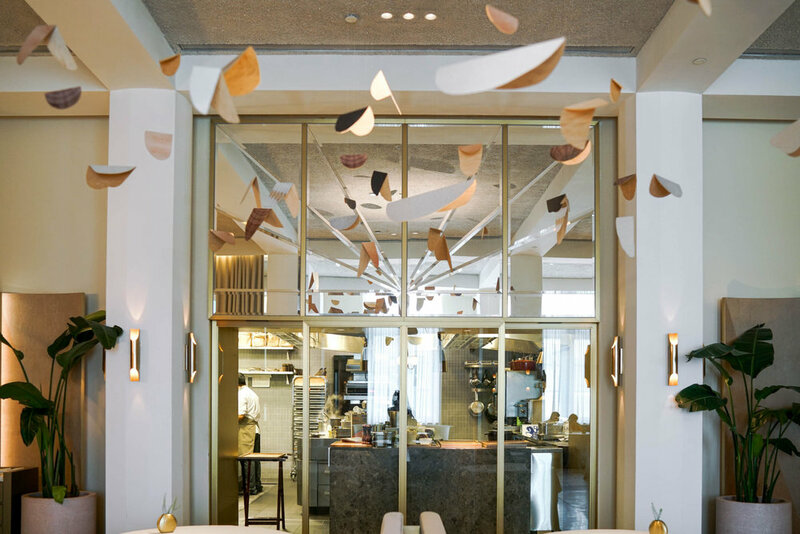 Now I am absolutely obsessed with Odette, based on this visit i may say it is my favorite restaurant in Singapore so far. Each dish was a unique creation that was well-prepared, and every single ingredients lead to a harmony outcome that bombs my taste buds. The service was attentive and have a good knowledge of what they are serving. This was honestly the best meal i have had in Singapore recently, and i couldn't believe i made another reservation in the following week. In short, Odette is my first (and the safest) choice for quality French food in Singapore.